In the comments of a post earlier this week, I mentioned that the Bible-reading goal I’ve adopted for this year is to take note of every use of the word ‘delight.’ I don’t know how spiritually profitable this will be for me, but reading for a specific word has been fun the first week. Who knows, perhaps this simple search will help me complete the plan I’m using for this year. It beats reading so that I can check the box, though checking a box feels like reward in itself some days. I am hoping two things come of this project. First, I want to see what scripture has to say about delight, about what delights the heart of God, about what delights men and women, and what ought to delight me as a child of God. I know I could use an exhaustive concordance and do a word study in a few hours, but I want this to be a daily adventure of discovery. Second, I just want to delight in God and His word more than I did the previous year. I hope to find delight when and where I least expect it. I’m planning to write about what I find and post it here. Of course, there may be some weeks that I don’t come across the word delight. If/when those times come, I’ll just share something that delighted me as I read the scriptures that week. As I wrote this post, a friend and I exchanged several messages via twitter about going through a season of spiritual dullness, and it occurred to me that maybe other readers and bloggers would benefit from or like to participate in a similar search for delight. Not that you would want to do the exact same thing I’m doing, but that you would like to share something that delighted you as you spent time in God’s word during the week. It doesn’t have to be “deep.” It could be as simple as sharing a verse and writing, “DELIGHT!” Or sharing a verse with a quote from a sermon that delighted you. Or sharing a prayer that God would renew your sense of delight and wonder in him and his word. I know the worrisome feeling and wondering, What is wrong with me? Why am I in this spiritual funk? Sometimes spending even a little time each day in the scriptures makes a huge difference. And so, a weekly carnival of sorts is being born. I made a button. I used a picture of Psalm 1 from my Bible and tried to make it pretty. Not too bad for my first button, but I know it pales in comparison to other carnival buttons. I’ll work on it some more and see if I can’t do better. 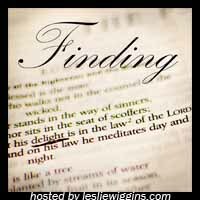 My “Finding Delight” post will go up early Saturday. Prepare your post (please copy and paste the html code from the above box to include the button in your post) and come here Saturday and Sunday to enter your post’s url. Visit a few of the other participant’s blogs and leave an encouraging comment. Delight together in God’s word. What if I’m not a blogger? You can participate via facebook. “Like” Alabamenagerie on facebook and you’ll be able to leave a comment under the Finding Delight post for that week, OR just share your verse on the wall that day. What if I want to participate, but I don’t blog or use facebook? Comments are always open around here. You can even post anonymously if you want to. I look forward to reading what delighted you each week! This sounds fun, Leslie! And good job on your first button! It makes me think of what Pollyanna called the “glad texts.” Those three hundred and something times God tells us to be glad or rejoice, and she says, “If God took the trouble to tell us that many times to be glad and rejoice, don’t you think He meant it?” —KJ was just telling me last night that he was thinking that Christians sometimes lived in a state of suspended belief, because if we really believed all the things the Bible tells us to believe we would be quite a joyful people. I’m looking forward to more delight in 2012. Me, too. I’m going to have to add Pollyanna to the list of older movies I should see at least once. What KJ said to you last night reminds me of something he said about this time last year, “Remember, you will inherit the universe. Live like it.” Then, he went on to say something about how that knowledge can cause joy to bubble up regardless of our circumstances. Wonderful truth. I’m excited about this! Thank you for hosting! I am using a different Bible Reading Plan this year. Each day I’ll be reading from a different place: Epistles, The Law, History, Psalms, Poetry, Prophecy, and the Gospels. I like your idea of reading intentionally for a specific word. And BTW, the button looks just fine!!! It sounds like we may be doing the same plan. I’m glad you like the button! Leslie, I love this! I was just having that worrisome, “Why am I like this?” thought last night during prayer meeting when I just felt so disconnected from the prayer. I know that faith is not dependent upon feelings, but there are times when it’s unnerving to be feeling so spiritually dull. I like this idea – I think I’ll use it to think much more intentionally as I read daily so I can write down delightful passages to share. It’s a great way to move daily reading beyond checking a ‘to do’ box and remember to think through what I’m reading as I pray for fresh delight in God and His word. Thank you for hosting! There are times when it’s unnerving to be feeling so spiritually dull. Yes, it is. I’m glad you’ll be joining in! I’m not really sure that I did it the “right” way, but it worked.